Virtual Nymph's Waterwing is a realistic wing membrane that is easy to use and makes realistic Spinner and Terrestrial insect wings. Trap Waterwing in-between a wing burner or fine point tweezers and burn to shape with a lighter flame. 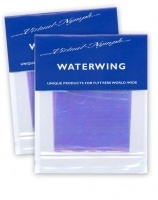 Waterwing is a very durable wing product with a reflective transparent prismatic sparkle. 1.9mm thick flexible fly foam suitable for Ants, Beetles and detached bodies. Hanked, strong stretchable floss that does not lose its colour when wet or stretched.